From Classical To Rock” where platinum selling rock stars and world- famous classical musicians performing together under one roof. Featuring Classical musicians, members from Goo Goo Dolls, Heart, Steelheart, Ex-Megdeth, Prong and hosted by Randy Jackson. 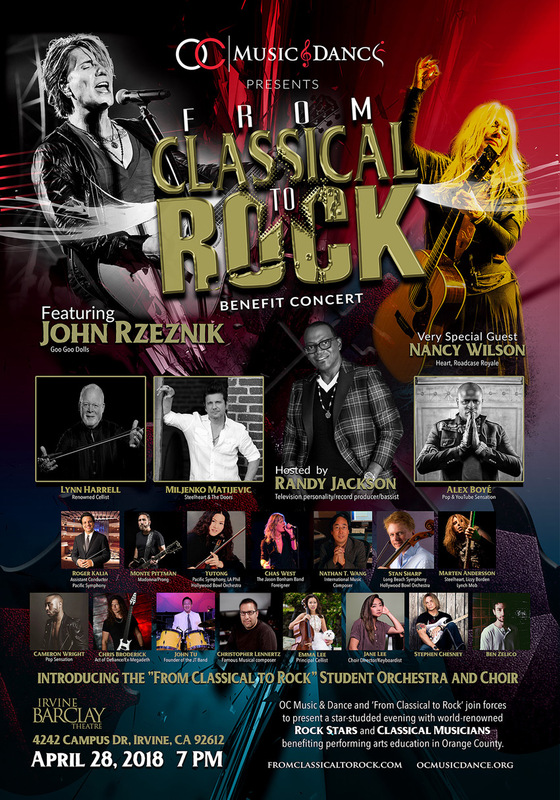 After last year’s incredible success, “From Classical to Rock” has joined forces with the non-profit OC Music & Dance School to present a star-studded concert benefiting music education for Orange County communities. Hosted by Randy Jackson and headlined by John Rzeznik of the Goo Goo Dolls, special guest Nancy Wilson (Heart) alongside “From Classical to Rock Youth Orchestra and Choir”, bringing young aspiring OCMD music students together with platinum selling rock stars and acclaimed classical musicians, performing together under one roof. This unique concert features high profile musicians from classical music, jazz to rock and roll with original music scored by one of the biggest Hollywood composers Mr. Nathan Wang, joined on stage by rock, classical musicians and members of the Pacific Symphony Youth Orchestra, members of the Donald Bren Honors High School Orchestra and Chorus, and the honorees of the Orange County Artist of the Year in music, voice and dance. In addition to headliner John Rzeznik and host Randy Jackson, special guest artists include nancy Wilson (Heart), Miljenko Matijevic (Steelheart, The Doors) Lynn Harrell (acclaimed cellist), Monte Pittman (Madonna/Prong), Alex Boye, Chinese violinist Yutong (Pacific Symphony, Los Angeles Philharmonic, Hollywood Bowl Orchestra), Marten Andersson (Steelheart, George Lynch, Lizzy Borden), Chris Broderick (Ex-Megadeth), acclaimed cellist Stan Sharp and many more. From Classical to Rock co-founder/co-producer Marten Andersson: “I am so honored and proud to co-produce yet another, even greater “From Classical to Rock” concert, benefiting music education. This time we joined forces with a nonprofit called, Orange County Music & Dance School. It’s an amazing (nonprofit) school who gives talented low income, minorities a change to be the next classical genius or the next rock star. All musicians involved with the event are contributing their time, energy and musical talents in an effort to benefit performing arts in Orange County. 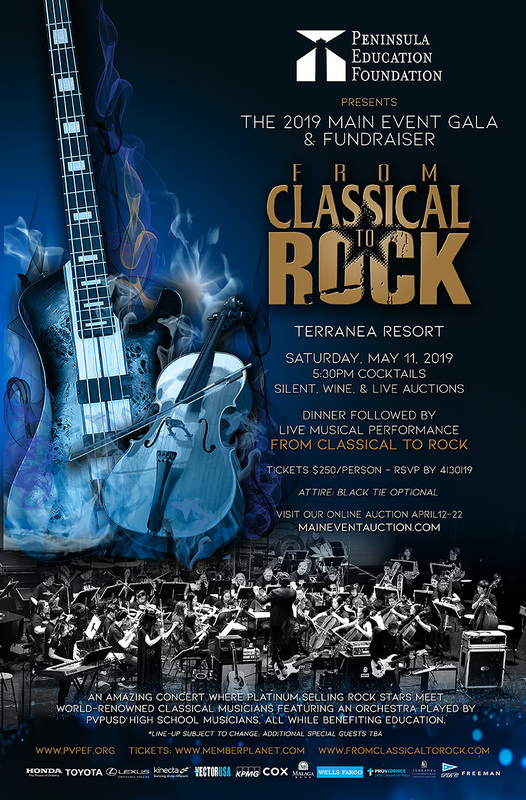 About From Classical to Rock: From Classical to Rock was founded in 2016 by the famous Chinese violinist Yutong, Rock musician Marten Andersson and acclaimed cellist Stan Sharp to help benefit music education. Stan, Marten and Yutong co-produced the first concert with bassist Robert DeLeo from the band Stone Temple Pilots and the late Chester Bennington from Linkin Park. The concert was a huge hit (it was also the last concert Chester performed with Stone Temple Pilots). The concert raised $50,000 for public music education. About The Orange County School of Music and Dance: OC Music & Dance is Orange County’s first and only nonprofit community performing arts school funded by Pick Up Stix founder Charlie Zhang. OCMD are dedicated to providing the highest quality education and resources for our students, regardless of their ability to pay. Our programs feature private and group lessons across a broad spectrum of art forms, as well as curricula for self-improvement, personal growth and professional development. OCMD mission is to nurture, inspire and empower Orange County’s most committed and talented youth to achieve their dreams and provide a path for them to follow their passions.